The species is distributed throughout Eurasia except of India and Arabian Peninsula. Armenia is inhabited by nominate subspecies, which occurs widely in the country, inhabiting meadows and calcareous grasslands at the elevation range between 1,700 and 2,800 m a.s.l., although some individuals have been recorded at 3,000 m. The Large Grizzled Skipper uses wide variety of host-plants such as Polygala spp.,Potentilla spp., Helianthemum spp., and even Carduus spp. and Rubus spp. The species gives one generation per year flying from mid July till the end of August. The species is uncommon within the typical habitat. 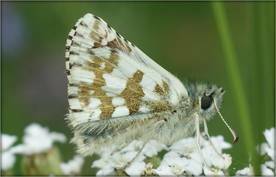 Since it belongs to the group of Pyrgus with difficulties of field identification, the real count of its number in the habitat is complicated by existence of similar species, such as P. armoricanus and P. serratulae. Therefore the data is insufficient for computation of the population trend. 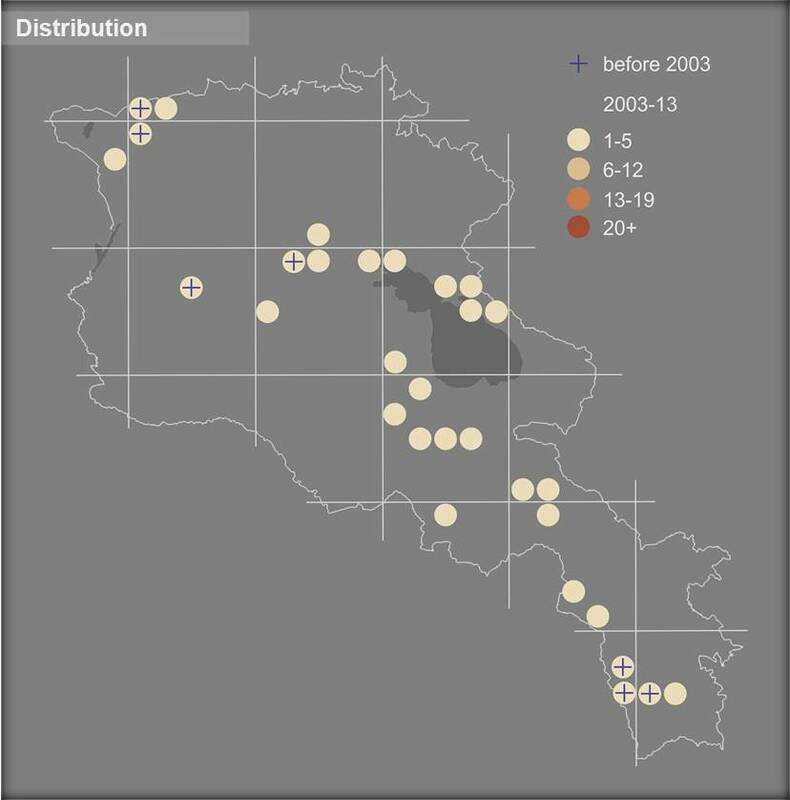 Based on the numbers of captured specimens it is possible to assume the absence of significant changes during 2003-2013, but the question requires further research. Most probably, the polyphagous nature of the species and its high level adaptability towards the larval host plants, make it less vulnerable towards the intensive grazing and mowing. The species is not included in the Global and National Red Lists, however it has been assessed for the European Red Book as Least Concern. The species is also not included in the CITES and Bern Conventions. Preliminary assessment of the species' conservation status suggests it as a Least Concern. Throughout its distribution range the Large Grizzled Skipper occurs in number of Protected Areas, Emerald Sites, and Prime Butterfly Areas. At current there are no urgent conservation measures need to be developed for the species, however it is important to improve its monitoring via development of proper count in the country; which is essential to track its further dynamics and mitigate threats upon their emerging.